It’s only been five days since iOS 5 was officially released, not even a full week yet, and is already installed on one out of every three iOS devices. 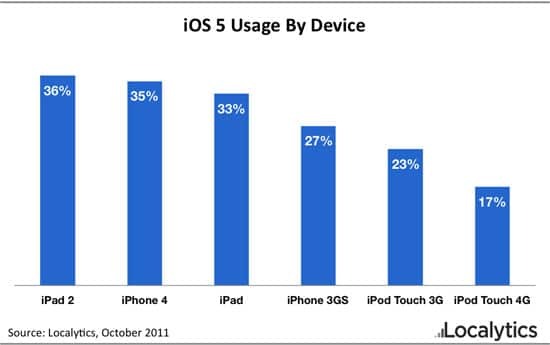 Obviously, this graph only includes iOS 5 compatible devices (iPad 1, iPad, iPhone, iPhone 3GS, and iPod touch 4G). The results in the graph comes from a mobile analytics SDK from Localytics that is integrated in thousands of apps from the App Store and using a range of “tens of millions of devices” as the sample size, according to them. iPhone 4S would be 100 percent, since every iPhone 4S come with iOS 5 installed out the box.